The Olympics are over. But let’s not forget that the Para-Olympics are yet to commence. Every event there is a champion effort. People giving their all, overcoming obstacles beyond than just training hard and pushing through pain. I really admire competition at that level. Somehow, often it seems so natural and so effortless. But what we don’t see if the years of commitment and determination to succeed. The focus is so often on Gold alone, or Second or Third, but every competitor has achieved something great even if only for their own performance. The world stops momentarily to watch so of the events. Take the 100 m Mens Sprint. Usain Bolt retains his champion status. What a race- so much intensity. Watch it here again recorded in high density footage caught from a rare up close camera…it is just like being there yourself. Unbelievable. 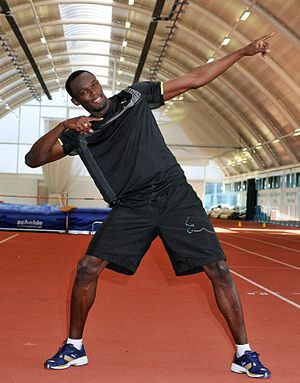 This entry was posted in Inspiration, Olympics, Usain Bolt and tagged 2012 Summer Olympics, Olympic Games, Usain Bolt. Lol! Is there anything those (seemingly) innocuous bricks cannot do? !